Was 2015 an eventful year for you? It certainly was for Miss Speechie at Speech Time Fun, who revealed her true identity this year! While my year may not have been quite as eventful, I’m linking up to share my events this year. Thank you, Hallie! 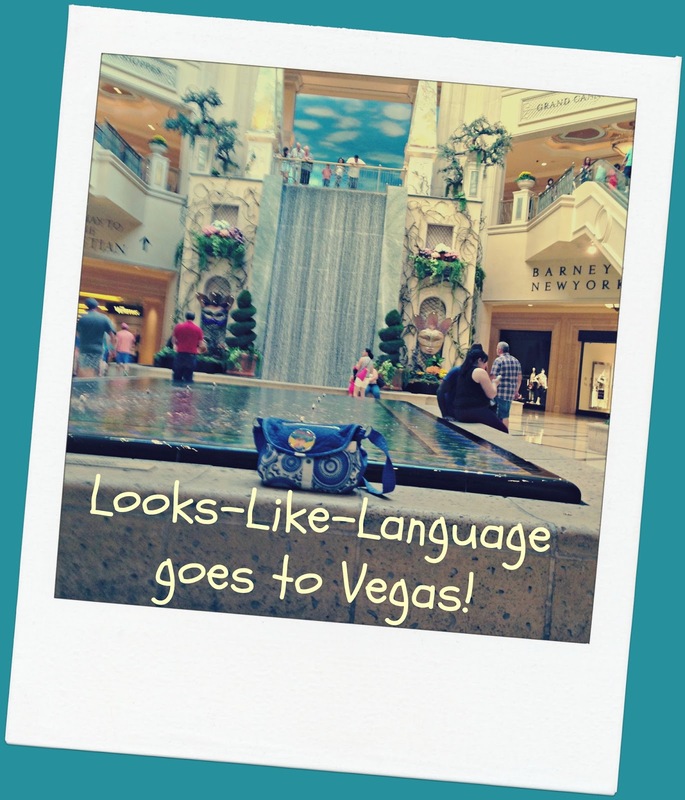 After 18 months on TpT, I had a blast at the conference in Las Vegas. I loved meeting up with all of the SLPs on TpT who were there. I learned a lot and loved the feeling of connection that came from meeting in person. I had been resisting starting a blog, wondering what I would write about and who would want to read what I had to say, but decided it was the way to go while I was in Las Vegas. I came home, started this blog, and less than 6 months later I am blogging on three blogs! That is a lot of writing for someone who was worried about one blog! In addition to my personal blog, I joined with a talented group of women I met in Vegas to form the Speech Spotlight blog. It is certainly worth checking out for all of the experience and viewpoints you will find there! Later, I was invited to join the bloggers at Classroom Freebies, Too! I realized that, despite its name, this blog for freebies actually includes materials for all aspects of education. What could be better than free? I can never predict where this adventure at TpT will take me! 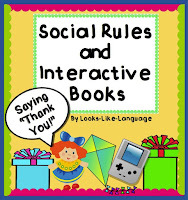 Thanks again to Speech Time Fun for hosting this blog link! So, now we are moving on to 2016. I wonder what happenings the New Year will bring? The holiday freebie has been updated! Click here to go to the new post. Freebie time! 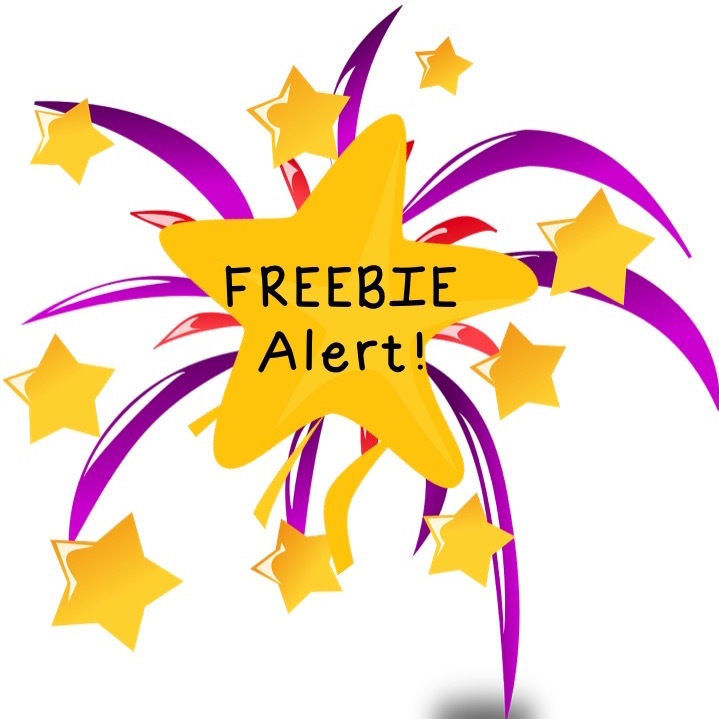 I sure hope you have been finding the freebies helpful! The December freebie has been updated! Click here to find it. 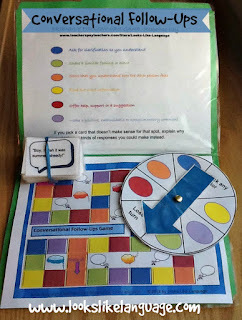 Carla at Comprehension Connection is hosting a linky on such an important topic! 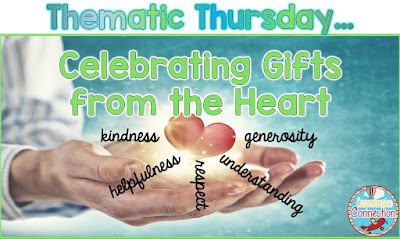 Thematic Thursday is all about the true gifts we give each other! Thank you, Carla, for the chance to join you! Kindness (and the other positive qualities we try to instill in children) are such a necessary part of getting along with others. As educators, we can teach no matter how quickly or slowly our students learn, but we feel blessed in the years when most of our students are kind. I think we all realize how important it is to have good qualities, but did you know that children as young as 2 1/2 may act mean and threaten to withdraw friendship? (Wall Street Journal) The good news is that we can teach children to be kind. 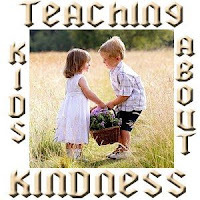 A study done at the University of British Columbia and at University of California, Riverside showed that students who were asked by their teachers to perform acts of kindness not only felt more connected to their classmates, but reported being happier! So, keep on asking your students to be kind and perform kind acts! But, what about the kids who need a little more help? Some students seem to be very self focused and others may not even realize the impact that their words have on others. Other students just need more practice in thinking of others’ points of view. They may not even know that there are multiple ways to verbally offer kindness. The game includes a card template for you to personalize so that students can get practice with the problems your students are having! Bring a little kindness to your room for the New Year! As much as we love the holidays, this can be a stressful time of year, especially for overworked moms and dads. Don’t you agree? It’s not like we already didn’t have too much to do. 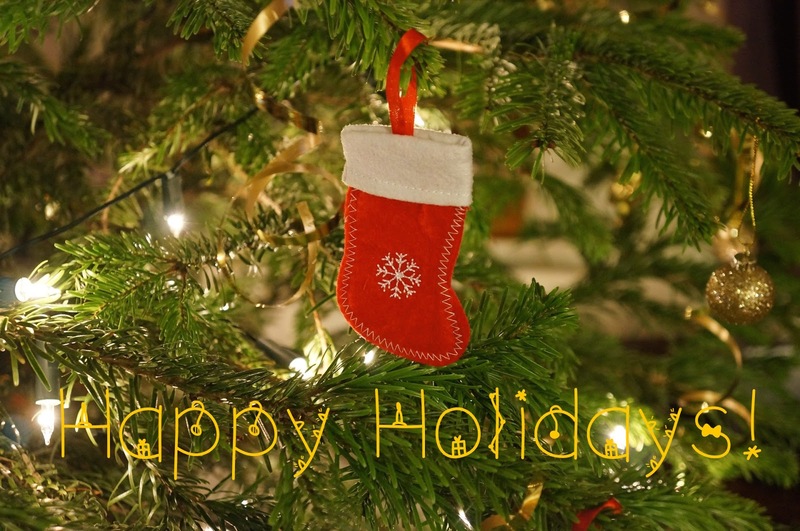 Enjoying the holidays can be easier if we try not to overdo in the name of the holiday spirit. A few family traditions and a happy family are all we really need to make the season bright! Sometimes simple is better in therapy, too! Young children really like playing easy games, without winners. Variations on a theme, or the exact same thing, suit them just fine. Do you have a book that you’ve read so many bedtimes that you feel you could do it in your sleep? Simplicity is why I loved being in a school with Ellison cutters and have saved the shapes for years, even though I am not currently working with preschoolers. If your school doesn’t have an Ellison cutter, don’t worry. 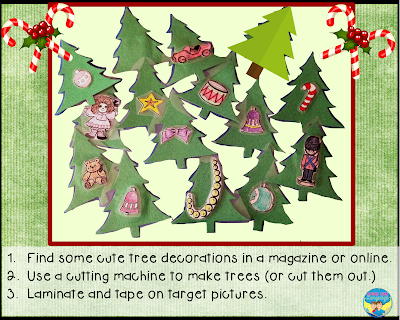 You can use this idea by finding simple shapes online and cutting them out with scissors and construction paper. For the pictured activity, your students need a blank tree to decorate. 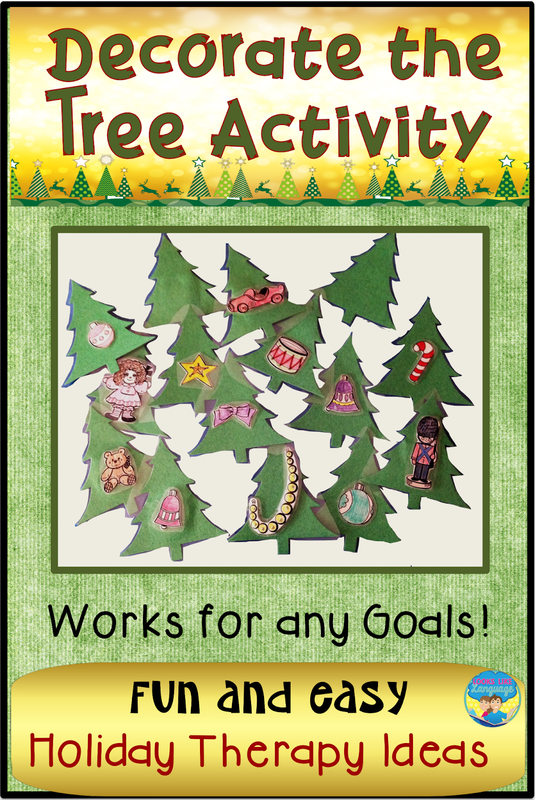 After saying their target sound or language goal, they pick a tree shape, turn it over, take off the decoration that is on the back of the small tree and put it on their larger tree to decorate it. Need a little movement? Place the large tree on your wall or cabinet. After saying the work and picking a shape, the students get to stand up and take the decoration to put on the shared tree. Kids love this activity! When it is time to clean up, students can follow directions to find the decoration you labeled or described and go get it off the tree! 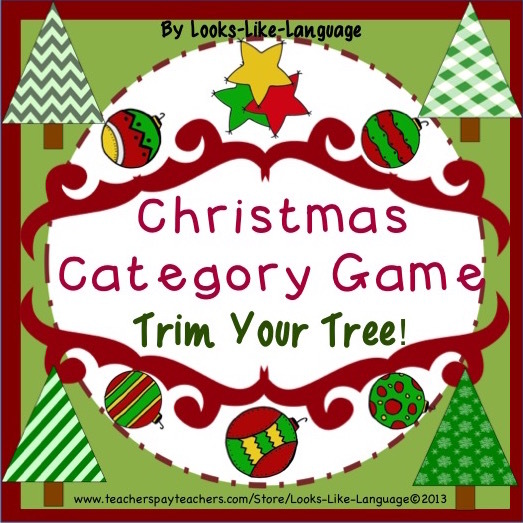 If you’d like a game for decorating the tree that has most of the work already done for you, check out my Christmas Category Activities. Now that we have solved your therapy problems this week, you’ll have more time for all of your holiday preparations! 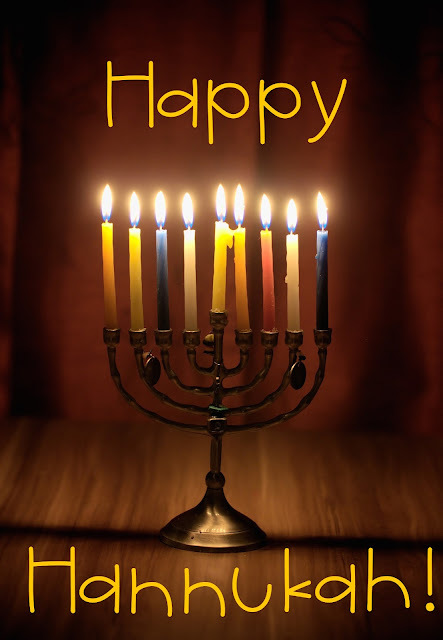 Whatever holiday you celebrate, I hope it will be a happy one this year! Cookies? Did someone say cookies? The smell of cookies baking, followed by eating the cookies (of course!) is one of my most favorite memories of the holidays growing up. 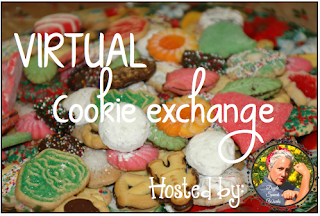 So, when Annie at Doyle Speech Works decided to host a cookie swap linky, it was a no-brainer that I had to join. My favorite cookie is an old standby, but tasty nonetheless. I’ve linked up the full sized recipe as a freebie, so you can just print it out and be ready to go! Click on the photo to get the full sized version. 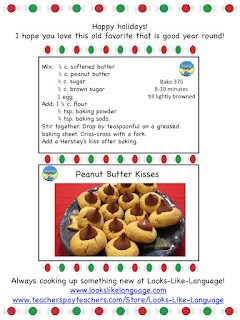 For more cookie recipes, head over to Doyle Speech Works and find out who has linked up! Thanks so much, Annie, for such a yummy idea! I hope there is something good cooking at your house for the holidays! 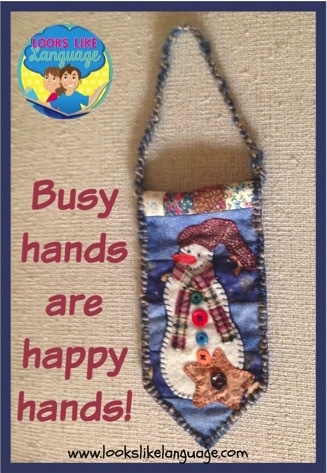 Busy, busy, busy, but a visual says it all, so quickly! They look... like language! I'm happy to join up with Teaching Trio! I hope your to-do lists are getting done! Enjoy Sunday! My friend Kim, at Activity Tailor, has the most wonderful ideas! 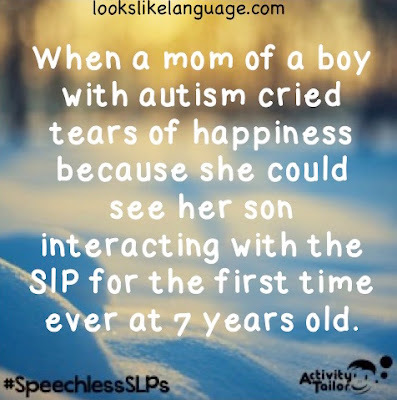 This week she is reflecting on moments that make an SLP speechless, and I thought I'd join in. It is easy for any of us to concentrate on all the difficulties we have in our jobs, and I am so grateful to Kim for her idea that got me thinking about the wonderful moments in my (long) career. People in education and healthcare fields go into this work because they want to make a positive impact on people's lives. For all of the frustration that I feel, at times, when I can't help this student make progress a little faster, or I can't get that student to focus at all one day, or I just can't stand all the paperwork one more minute! !, I also have those moments over the years when I know that I have had an impact. These warm feelings are what keep me coping when I wish I had just stayed home that day! We may not get bonuses, or conferences in interesting places, and we barely get lunch some days, but we have the knowledge that we helped someone's loved one. Maybe yours! Happy December! I have a surprise for you! I will be making a freebie a week (for as long as I can manage it!) 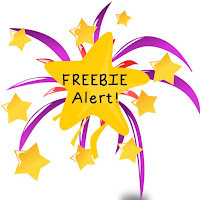 What better place to make the link to the freebie available than here with my readers? The posts will be short and sweet, but I hope that you will think the freebies are awesome! Share the love- thank me by pinning or posting the links. When it comes to freebies, the more the merrier! 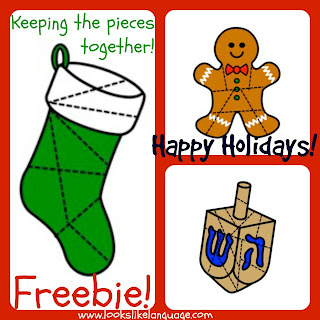 Just click here to get the updated December freebie! Can you envision your student opening a present at the holidays and saying, “But this isn’t what I wanted!” If so, this activity is for you! Shoeboxes can be a fun, functional way to teach play and language skills. What better activity this time of year than to work on language for opening presents and saying “thank you?” Children need to practice language in routines a lot before it becomes routine for them to use. They will love to keep practicing with this! * Some small toys that will fit inside- start with only toys that your student will like. Later, add some disliked toys to practice saying ‘thank you’ when you really want something different! * 4 pictures of gifts to fit the size of the openings. * Paper to decorate the shoebox, if you wish. I used this without ever decorating it and my students couldn’t care less. They had a great time anyway! 1. Cut a file folder in strips that are as wide as the box is tall to use as a separator. 2. Cut one strip to the length of the box. Tape it on both sides inside the center of the box. 3. Fold the additional strips in half, place them inside the box and tape them together like crazy until you have dividers that will stay stiff and make the inside of the box in 4 sections. I promise you, the kids won’t care what it looks like inside as long as you have something fun for them to play with! You just need four compartments with a divider that is sturdy. 1. Draw 4 squares on the top of the box. Leave enough space in between that the top has some support while the little ones are opening and closing the presents. I left about 1.5-2 inches between mine. 2. Decide which way is the top, then cut out three sides of each square, being consistent. Razor cutters are great for this, but you can use scissors. Just punch a hole with one of the blades first to get you started. 3. Glue a different gift picture on each flap. 4. Glue on symbols for the language you will be modeling. 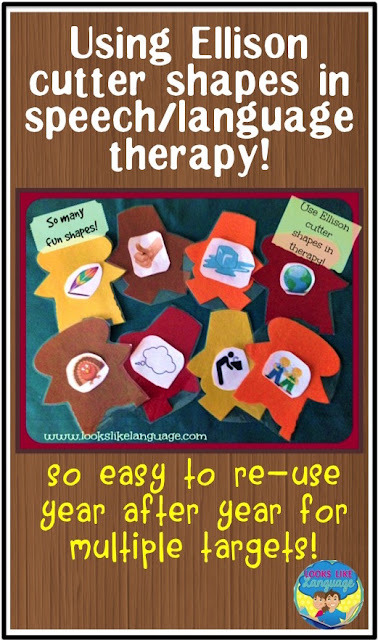 Make the ‘thank you’ symbol removable if you have nonverbal children using picture exchange. Students can request to open the color present, respond with ‘thank you’ after receiving the toy inside, and have fun playing! 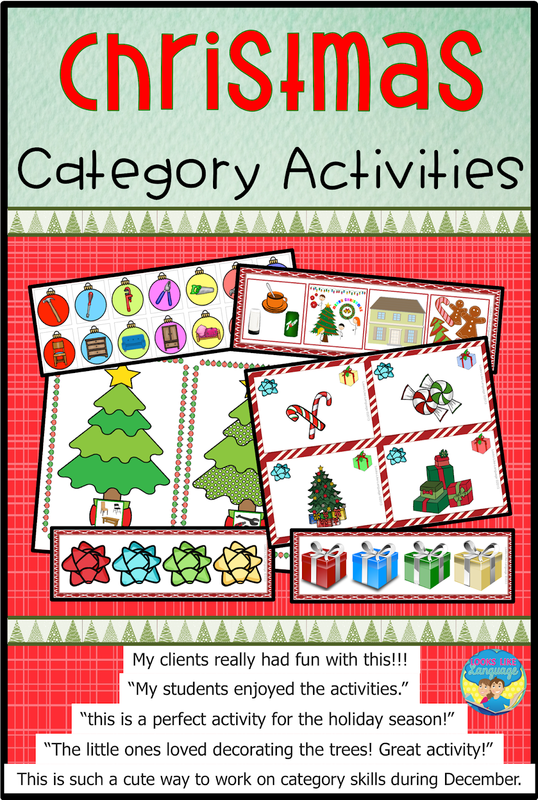 This was such a fun activity for my students, we played it almost every session all December long! 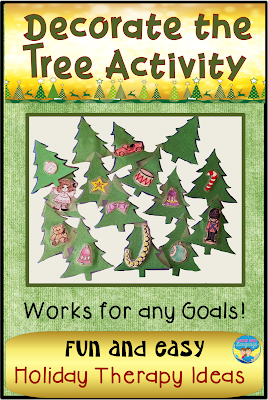 You can use this activity for the holidays and for your students’ birthdays, too! They just love the excitement of opening up the box and seeing what is inside. 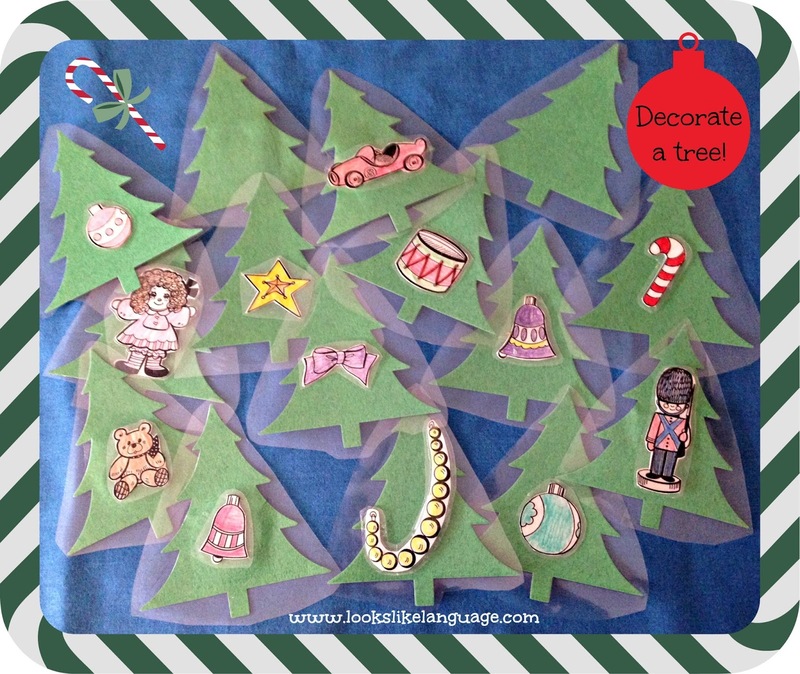 I taught it as a language activity at the beginning of the month, then kept it available for requesting to play for the rest of December, changing the toys inside every week to keep it fresh. Then, pull it out for a quick review on someone's birthday! If you have students in your group who already say thank you, just find small holiday figures or toys to work on labeling, requesting or play skills. Do you want even more ways to reinforce this functional language? 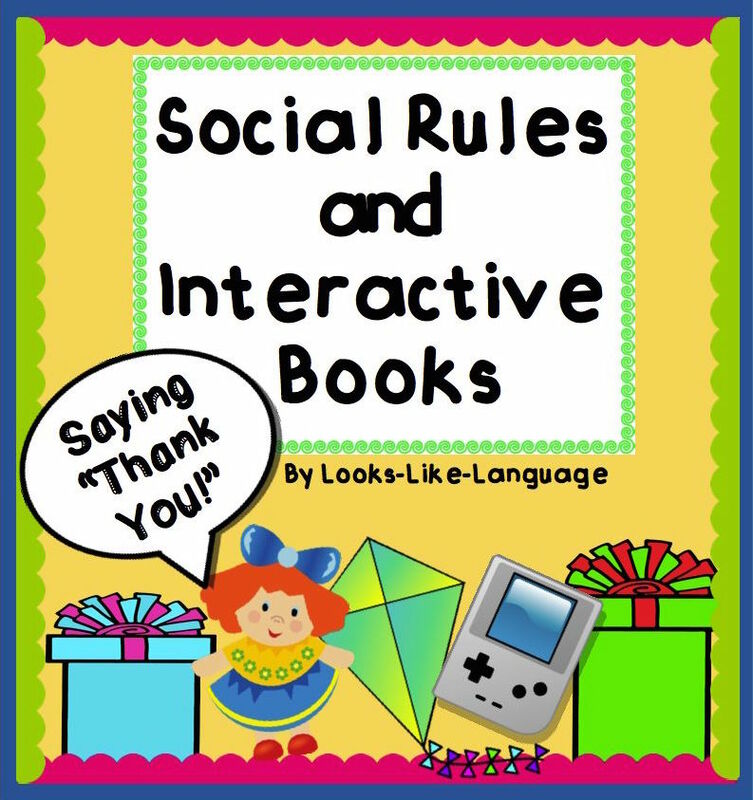 Check out this interactive book! I say, "Thank you for stopping by!" I usually try to bring you information and ideas that you can immediately put to use. (I hope I’m succeeding!) However, 4 times a year TpT offers a site wide sale. My whole store is on sale, so you can get 28% off every item, including already reduced bundles, when you use the code- SMILE. The great deals certainly make me smile! 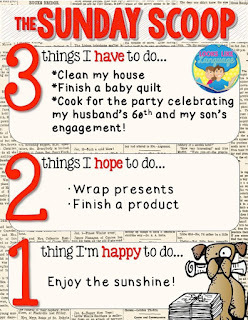 I want to thank Jenna Rayburn from Speech Room News for hosting this linky party and inviting me! 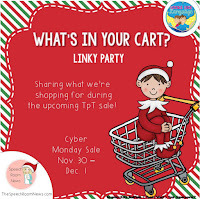 Go to her blog to access more product reviews and make your sale shopping easier! So, for this special post I wanted to share with you some of the new bundles I have in my store, and a few items that are in my shopping cart. Feel free to comment with anything that you’ve found- maybe there is something I missed that I really need! 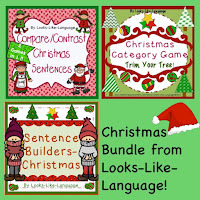 With the holidays coming, I thought that a Christmas Bundle might come in handy. The skills are varied, so you can build a lot of language with this bundle. 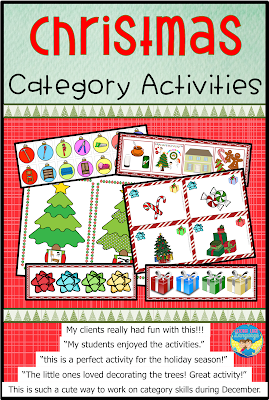 Your students will be having so much fun, they won’t even realize that they are working while they make noun-verb-object sentences, work on categorizing skills, and to tell how holiday items are the same or different. If it is holiday time, you know that winter is not far behind! 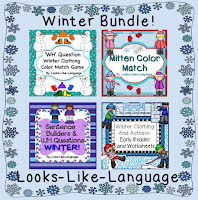 Make your life easier by using my Winter Bundle to build your students’ language skills for noun-verb-object sentences, matching colors and left-right concepts, answering WH questions while naming winter clothing, or try an early reader with Fry 100 words and winter actions. Now, for what’s in my cart! I am so excited to purchase these! 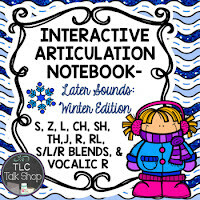 The TLC Talk Shop has all of your winter articulation needs covered with this winter bundle: data sheets, games, spinners, cut and glue worksheets, homework and interactive fun! Her products have cute graphics and are beautifully laid out as well. 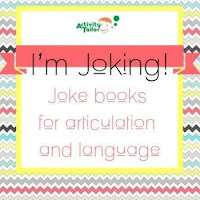 I love that Activity Tailor made an activity for figurative language using jokes! My students struggle with all types of nonliteral language, and jokes are so much fun! Students need to have fun in speech! Quite a few of my students don’t have appropriate intonation patterns when they speak. I can’t wait to try this great set from SLPrunner. I love the graphics, the variety, and that it includes a game board! I hope that I’ve given you some good ideas to help you with your caseload! Thanks again to Jenna for the invitation to link up! 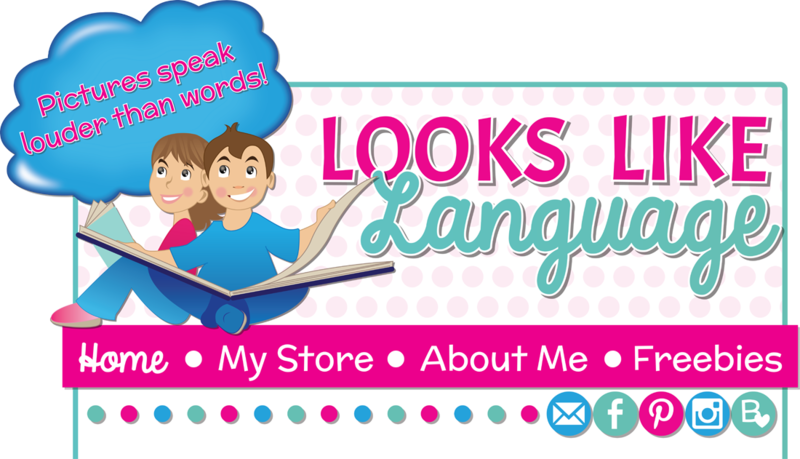 Don’t forget to check out Speech Room News to get more information on the great products for SLPs at TpT! What’s in your cart? How to Use Ellison Cutter Shapes in Therapy- A Quick and Easy Tip! Thanksgiving is definitely one of my favorite times of year! I love that the weather isn’t freezing cold yet and that it is still light outside for a while after school. I love the smells of good food cooking and loved ones to share it with. Pumpkin pie tastes so good, yet I never make it any other time of year! It’s fun to incorporate Thanksgiving themes into therapy this month. I love to do this without making the Thanksgiving vocabulary the main focus of my activities, but still have some Thanksgiving fun! One great way of doing this is to make use of Ellison cutters, if your school has them. If not, you can use simple outline shapes from an online search. 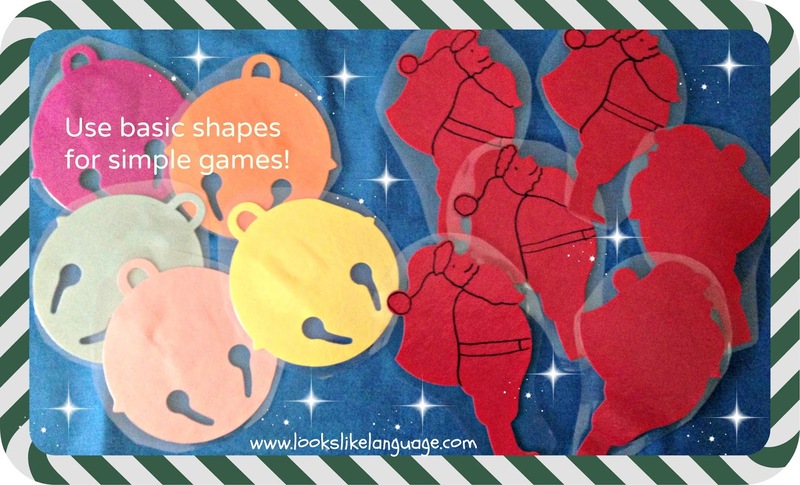 Choose the seasonal vocabulary you want to reinforce for your shapes. In the picture, you can see that I used Pilgrim boys and girls to co-ordinate with the book I was using then. Cut out the shapes in varied colors and laminate them without anything on them. Yes, just plain shapes! This lets me individualize based on what my students’ speech/language goals are each year. Photocopy and tape the pictures you need onto the laminated shapes, whether they are speech sounds, food vocabulary or action pictures! Now you are ready to play simple games, with or without a board. One of my favorites is to turn all of the shapes over in a pile. Students get told what they are working on (collecting) that session and request a shape using descriptive vocabulary. My lower students might ask for the orange Pilgrim girl, while my higher students might have to request the red Pilgrim boy in the bottom row. The first student to collect the stated number of shapes (with their goal pictures) and use them all correctly becomes the winner. The tape and pictures will hold for the month. Next year, if you need different pictures, just pull off the tape for an easy change! Although if you store your materials in very hot conditions over the summer, you may want to take off this year's pictures before storing! Presto! Change-o! A quick and easy therapy tip that saves you time in the years to come!